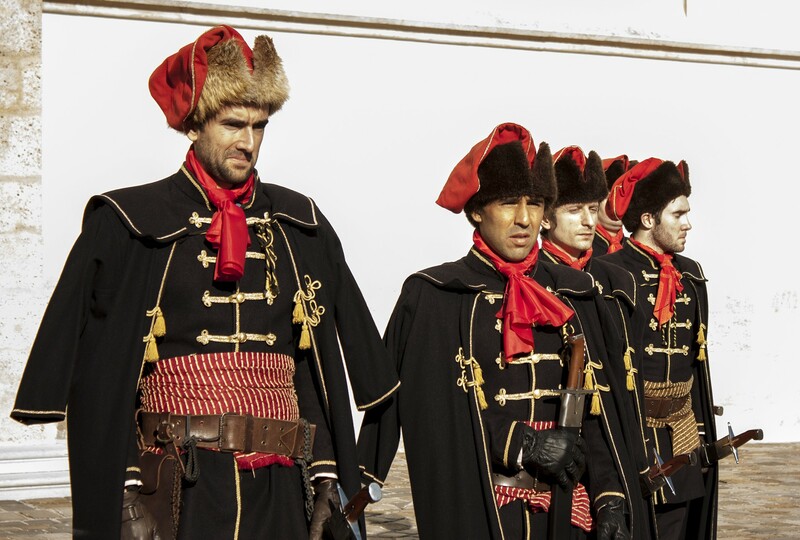 Tennis players as members of the Cravat Regiment posed in front of the St. Mark’s ChurchMonday February 2nd 2015 – Marin Čilić and Marcos Baghdatis have jumped into uniforms of the Cravat Regiment and lived one day as part of the honorary guard. 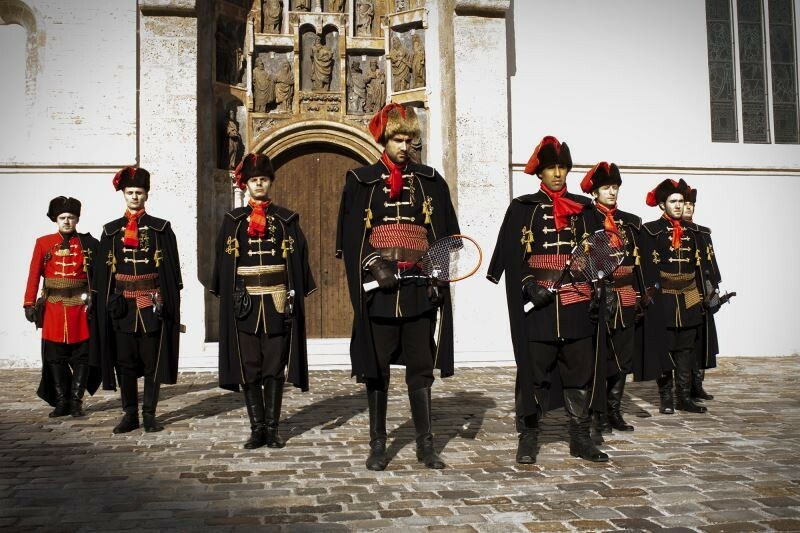 Their posturing in front of St. Mark’s Church in Zagreb attracted a large number of tourists and passers-by that could not believe their eyes when they realized that two familiar faces that they’ve seen in uniforms of the Cravat Regiment are actually Čilić and Baghdatis. 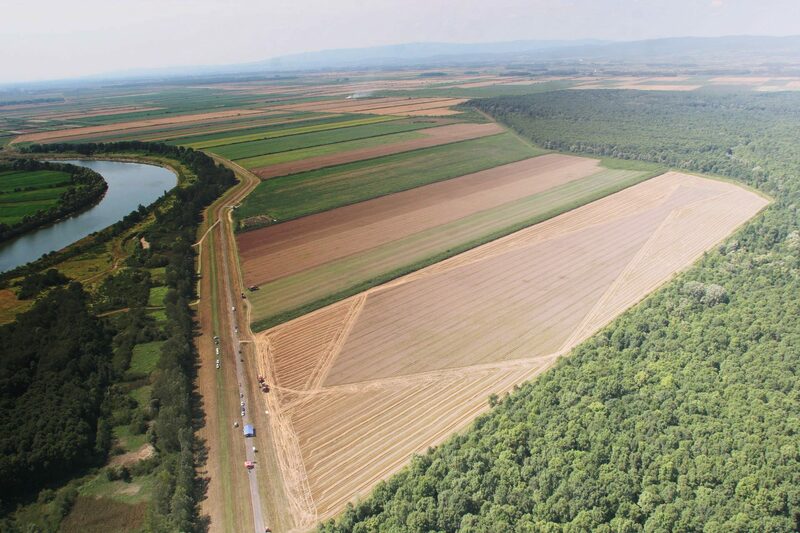 Cultivating land is the foundation of human civilization in general. 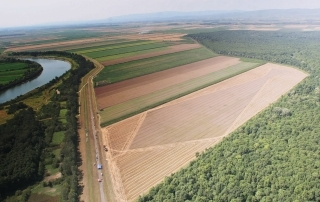 Cultivating fields (agera) leads to agriculture, and in a figurative sense every area of man’s work is a field. So also in art, we talk about the field of a picture, which in land art has becomes the literal field on a background of land. If we turn our attention to what is added to the field, we can talk about formation, whether in pigments of colors or anything else. Here in this case, it is the grain, an elementary food, which feeds the human race, which receives a blessing as food, a value which we should never cease to appreciate and honor in a special way. In the series of art projects by Marijan Bušić – a series which began with the thunderous Tie Around the Arena – a spectacular, symbolic message, a mega attraction, installation and performance brought together in a unique way, whereby the concept and performance find maximum expression. Then came the turn of the project The Tie in the Rye. The tie in the rye is a true acknowledgement of value; with concern for the environment it could be described as ecologically aware, a nature-friendly project. Through the material of which it was made it glorified the grain, by its form, it glorified, of course, the tie. This unusual, wondrous article of clothing, praised and criticised for its lack of practicality, which makes some people attack it and seek to do away with it – is identified as a work of art. That is to say, it is well-known that art is defined as a product which does not, strictly speaking, have a specific function, or any practical value. However, despite the lack of this component, art is the highest product of the human spirit. 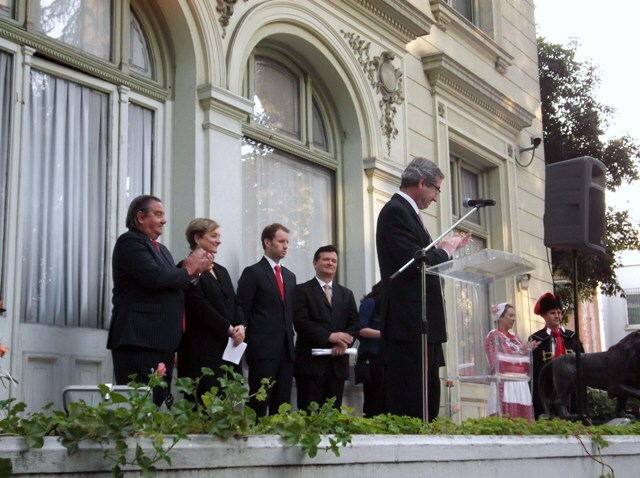 19.09.2007 In the Ethnographical Museum in Zagreb, an exhibition of photographs has been opened, entitled “The Knot in the Rock – the Cravats of Imota” organized by the Academia Cravatica. 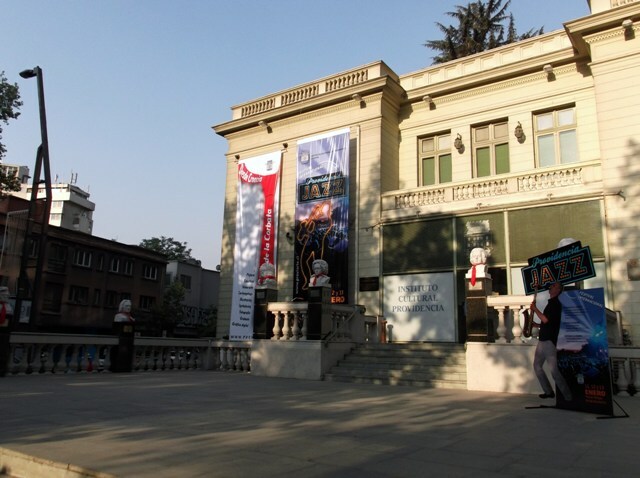 The exhibition consists of about 220 old photographs taken in the period from the middle of the 19th to the middle of the 20th century. 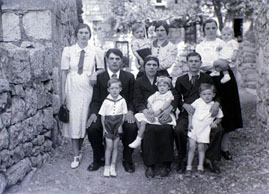 The photographs, as unique documents of time, show the people of the Imotska krajina over that one hundred year period, a variety of people and groups, from labourers to “gentlemen”, in a variety of life situations, but with one common characteristic – they are all wearing cravats as ornamentation. 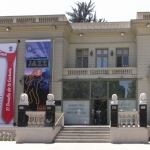 The editors of the exhibition are Sanda Lončar and Suzana Budimir, and the exhibition collection is also the work of Nikola Albaneže. It is open until the 30th September. 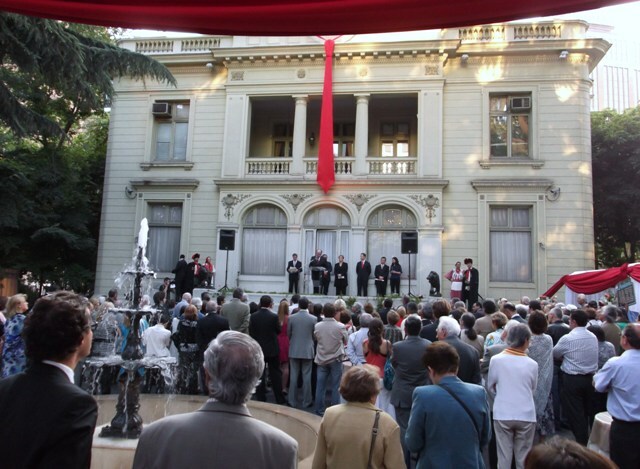 On 26th September 2007 in the Ethnographical Museum a monograph was presented from the series “Cities, Regions, Countries and the Cravat”, entitled “A Knot in the Rock – the Cravats of Imota”, sponsored by Academia Cravatica. For you, our dear friends and visitors to our web site, we present the introduction to this book, by Sanda Lončar, entitled A remembrance and sign. Academia Cravatica was founded in 1997 with the mission of promoting the tie or cravat as part of the Croatian, European, and world cultural heritage, and as a special medium of communication. The cravat is the only Croatian symbol which is universally known and appreciated, and at the same time is recognized and acknowledged as a Croatian symbol. The Croatian origins of the tie or cravat, founded on historic, ethnological and linguistic facts, are confirmed by world encyclopedias and other scientific sources. 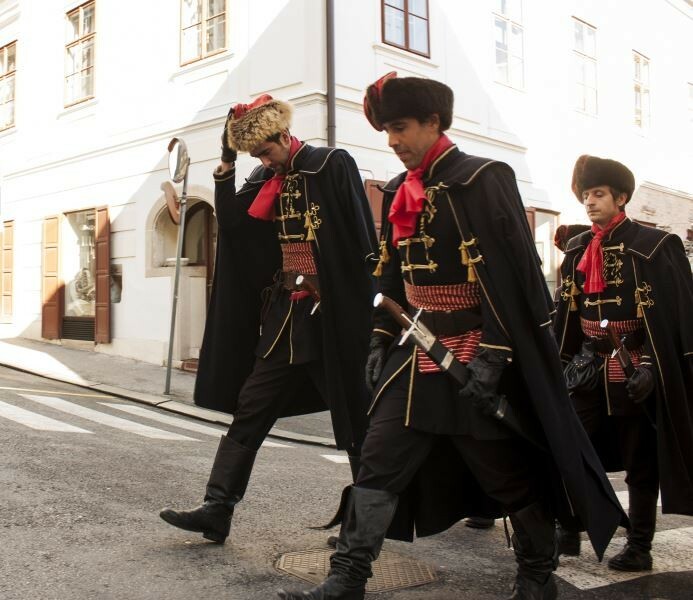 In addition, the many projects run by Academia Cravatica over the past ten years, have promoted Croatia – the homeland of the cravat, on a world scale. 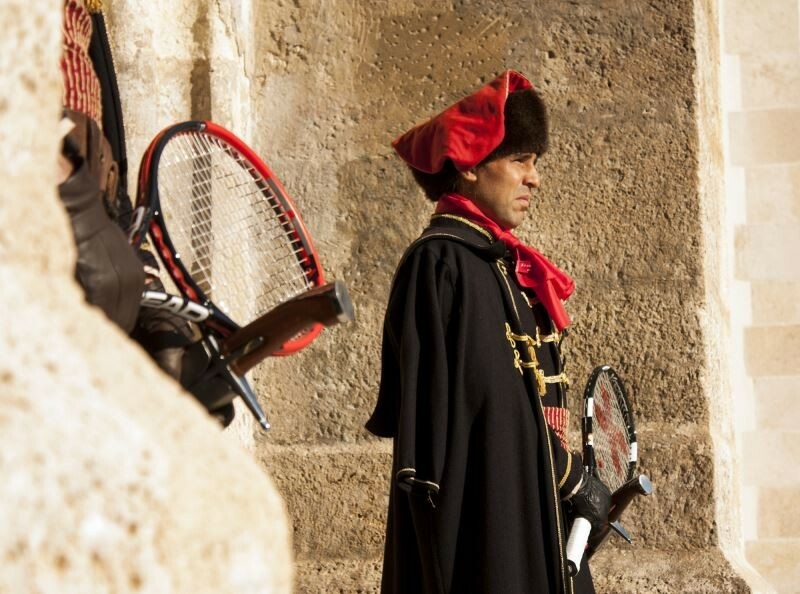 For example, the installation “The Cravat around the Arena” in Pula on 18th October 2003 was staged as a major world performance, which was seen on television throughout the world by more than a billion people. 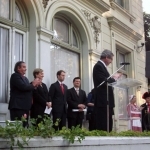 It is considered that this was the most ambitious promotion of the Croatian identity in the world to date. 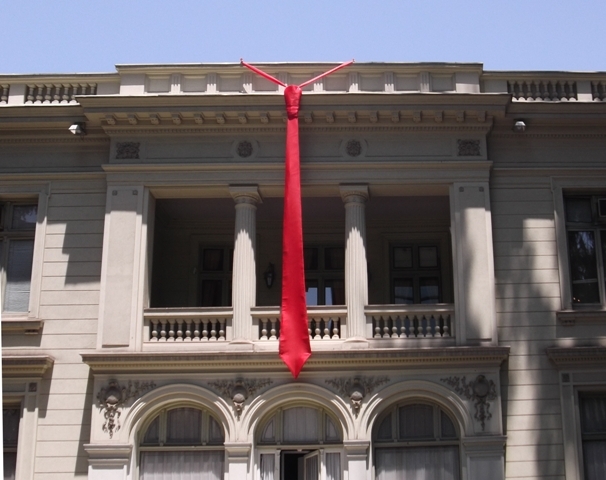 This installation, with the largest cravat in the world, symbolically brought together the ancient and modern ages, and the red color of the cravat sent a message to the world of love and life together of peoples and nations. Croats gave the world the cravat, but it was nurtured, developed and perfected by other nations. For example, the Americans conceived a cravat in three parts and thereby perfected it technically. But the most important contribution to the development of the cravat came from the French, the English and other European nations. Therefore the cravat is a symbol of Europe. This is seen in the now common custom of the European Union that each country presiding over Union presents its own specific cravat at the beginning of its term. The cravat is a universal symbol of elegance and the culture of dressing, but its powerful symbolic potential contains many other values. The vertical cravat symbolizes the human vertic al – human dignity and self-awareness, moments of solemnity and ceremony, success and a business spirit… With its lightness on the one hand and the knot on the other, the cravat “binds” together freedom and responsibility. It encourages us to be more aware in our communication of our dignity and the dignity of others – our freedom, but also our responsibility. 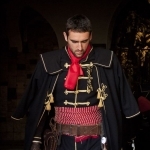 Due to its enormous symbolic power, the cravat is of great significance for Croatia and the world. Marking Cravat Day, will contribute to the establishment and illumination of all the positive values of identity in Croatian society, and a recognizable and positive image of Croatia in the world. 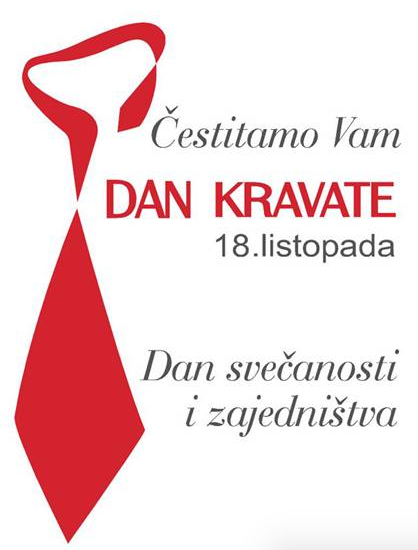 The initiative for marking Cravat Day has been supported by the Prime Minister dr. Ivo Sanader, and the program to mark the day will take place under the patronage of the President of the Republic of Croatia, Mr. Stjepan Mesić. 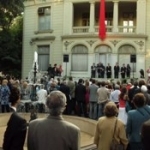 The proposal to mark the national Cravat Day has also been supported by the Committee for Education, Science and Culture of the Croatian Parliament. 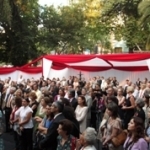 Cravat Day will be marked by social and cultural events in several towns in Croatia, and, with the support of the Ministry of Foreign Affairs and European Integration of the RoC, in some other cities around the world. We invite social and cultural institutions and Croatian citizens, in this country and abroad, to mark Cravat Day in their own communities in a worthy manner, as a day of celebration and community. 18th October – The Cravat day! The purpose of Cravat DayThe installation “A Cravat around the Arena”, performed on 18th October 2003 in Pula, created by Marijan Bušić, was as a world scale spectacle, seen on world television by more than a billion people. It was assessed as “the most ambitious, most well-thought out concept and project to promote the Croatian identity” (Ive Šimat Banov). 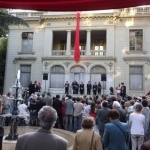 Through this installation, with the largest cravat in the world, the ancient and the contemporary eras were linked symbolically, and the red color of the cravat sent a message to the world of love and life together for all peoples and nations. At this year’s book fair in Leipzig, where Croatia was a partner country, on the title page of the program book of Croatian authors there was a picture of precisely the Cravat around the Arena. “The cravat is communication, a universal symbol of dignity and dress culture, and its symbolic potential also holds other values. The vertical cravat symbolizes the human vertical – human dignity and self-awareness, a moment of ceremony and celebration, success and the business spirit… By its fluttering lightness, however, on the one hand, and the knot on the other, the cravat “binds together” freedom and responsibility. It encourages us to communicate more aware of our own dignity and the dignity of others, our freedom, but also our responsibility. Due to its huge symbolic power, the cravat has epochal importance for Croatia and the world” Marijan Bušić pointed out, as the initiator of the project, Croatia – the Homeland of the Cravat. 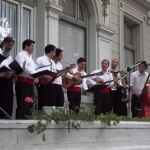 With the cravat and the AC projects, Croatia is not only presenting itself to the world but is communicating with it, thereby showing its desire for openness and an exchange of cultural values with other nations. This desire for openness to other cultures, despite its suffering in history, has always been a dominant characteristic of Croatia’s relationship with the world. 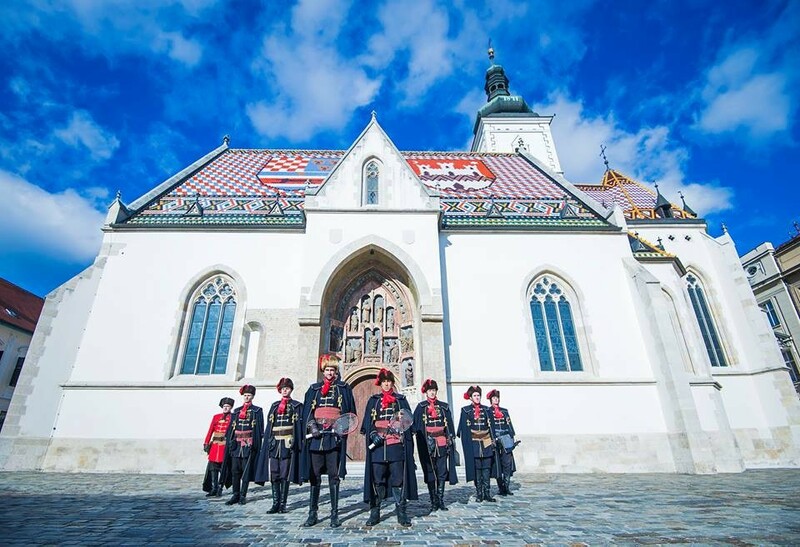 After the worldwide success of the Cravat around the Arena installation, which pointed out the cravat as a special medium on a world scale, AC launched the initiative to mark 18th October every year as Cravat Day in Croatia and the world. Last year’s Cravat Day was promoted on 18th October as a “day of ceremony and community” under the auspices of the President of the Republic of Croatia, Stjepan Mesić, and was marked by a series of cultural and social events throughout Croatia – in Zagreb, Pula, Rijeka, Zadar, Split, Knin, Imotski, Dubrovnik, Ogulin, Varaždin, Karlovac, Osijek, Nova Gradiška, Slavonski Brod… Some of these events were prompted by AC, and many events were initiated by towns, tourist boards, various cultural associations, and individuals at their own initiative. Cravat Day was “celebrated” in various towns throughout the world, in Dublin, Tuebingen, Como, Tokyo, Sidney… Last year, the celebration of Cravat Day confirmed that people in Croatia and the world understand and accept the message and value of Cravat Day. We believe that marking Cravat Day contributed to establishing and awareness of the positive values of identity in Croatian society, and a recognizable and positive image of Croatia in the world. At the same time, the cravat, with its powerful symbolism, may be a factor in strengthening European identity and unity. 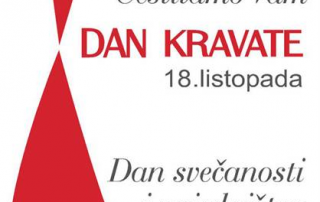 Therefore we propose that the 18th October be marked every year in the Republic of Croatia as Cravat Day, and that the same proposal should be sent to the European Union and the UN. 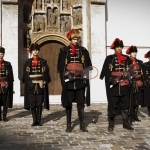 During the Thirty Years War in the 17th century (1618-1648) Croatian soldiers were known everywhere as exceptional warriors, and they joined the French royal army. Alongside their military skills they were noted for one detail. They wore a kerchief tied around their necks. That kerchief, tied in a knot, quickly spread as a fashion accessory and took on an ethnic name, so the name of the nation – Cravate (Croates, Hrvati) – became the name of that item – the cravat. The Croatian origins of the tie/cravat, founded on historical, ethnological and linguistic facts, are confirmed by domestic and world scholarly sources. For example, the French monograph Le Grande histoire de la cravate (author Francois Chaille, Flammarion Press, Paris, 1994) explains and specifically confirms the Croatian origins of the cravat. The Encyclopedia Britannica, under the noun “cravat” states that it derives from Crabate, Cravate, Croatian and that the appearance of the cravat dates from 1656. 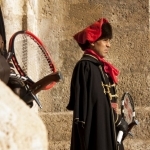 The Italian monograph Miss Cravatta, published in 1996 in Como, the best-known European and world centre for the production of cravats, undisputedly links the origin of the cravat undisputedly with the arrival of the Croatian cavalry at the time of Louis XIV etc. Questions (and the correct answer given) about the Croatian origin of the cravat are being asked increasingly on television quizzes in Japan, Turkey, Germany, Italy and other countries. 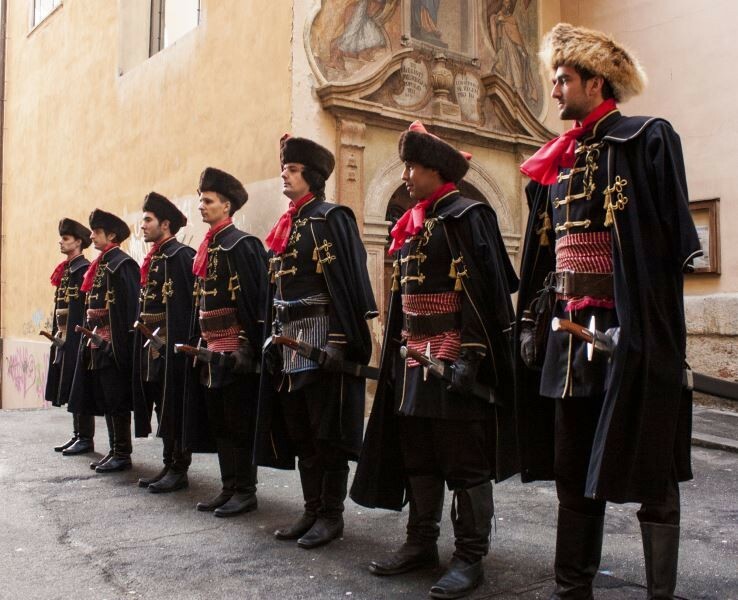 The colorful kerchief of our soldiers in the Thirty Years War was taken from Croatian folk costumes. 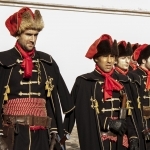 In Croatian traditional culture, there are as many as about forty men’s and twenty women’s folk costumes, both in Croatia and in other regions where Croats live – with a knotted kerchief as an essential part. The cravat is an “exceptional example of Croatian design of planetary value” (Boris Ljubičić) the only Croatian symbol that is universally known and appreciated, and at the same time recognizably Croatian. Croats gave the world the cravat and other nations have gone on perfecting it and made it into a universal symbol of dignity and male dress culture, a fashion accessory, which is increasingly interesting to women. The Americans conceived the cravat in three parts and so brought it to technical perfection. The most significant contributions to the perfection of the cravat came from the French, the English and other European nations. Therefore the cravat is a symbol of Europe. This may be seen in the already common practice of the European Union, where each presiding country, at the beginning of its term, presents itself with a specific cravat. “The example of the cravat shows that we have something to show to the world. Croatia has something to offer, it has evidence that we have made a contribution to world culture,” (Tomislav Šola). At the end of the 20th century the cravat “returned” to its Croatian origins. Up to 1990 the extraordinary fact of the Croatian origins of the cravat was for the most part not an integral part of Croatia’s self-awareness, and the Croatian origins of the cravat were only known by a few scholars in the world. Today the cravat is “certainly the most recognizable Croatian souvenir and a kind of symbol… It is appropriate for the promotion of Croatia since it is already generally accepted in the world and it is at the same time both Croatia’s and the world’s. It is also an inexhaustible source of stories and inspiration. So through the story about Croats and the cravat the story of Croatia is also indirectly spread in the world’s media” (Božo Škoko). 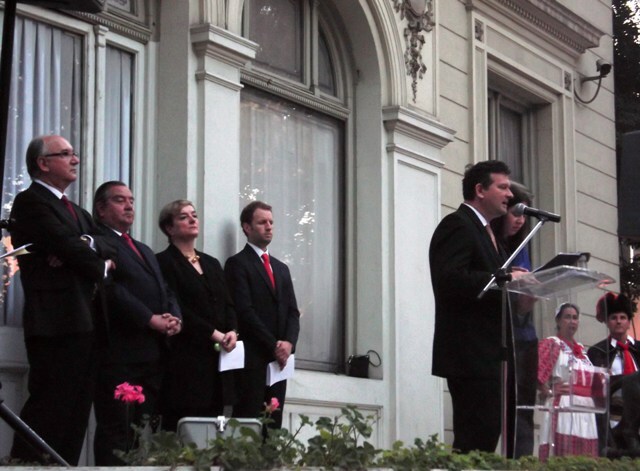 This major step forward began in the nineteen-nineties when the project, “Croatia, the Homeland of the Cravat” was launched, with visionary conviction that Croatia can present itself most worthily to the world precisely as the “Homeland of the Cravat”. As part of that project the Croata brand of cravat was launched along with the not-for-profit institution Academia Cravatica (AC), with the mission to promote the cravat as a special medium and part of the Croatian, European and world cultural heritage. Without the projects by AC the fact of the Croatian origins of the cravat would probably remain just another one of our unused historical opportunities. In 1990, the Croata brand was founded in Zagreb, with the visionary conviction of Marijan Bušić and Zlatko Penavić that Croatia could be presented more worthily to the world precisely as the “Homeland of the Cravat”. The new Croatian product – Croata cravats, became a Croatian souvenir recognized throughout the world, containing three marks of the Croatian national identity: the Croatian origins of the cravat, the national name Croata and motifs from the Croatian identity using the cravat as a medium. 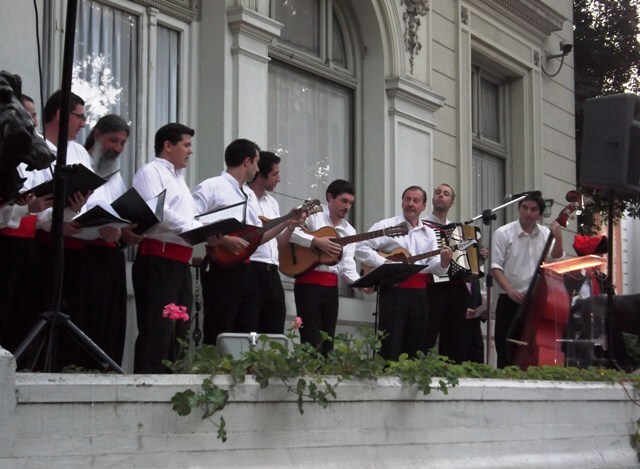 The cravat’s powerful potential as a means of communicating identity was recognized from the very outset, and since then Croata cravats have been used intensively in the tourist and diplomatic promotion of Croatia. The Croata brand places Croatia in the select company of the few countries who have their own original, and at the same time globally recognizable brand. This brand symbolically expresses the harmony between Croatian self-awareness and identity, on the one hand, and its openness to its European identity and global cultural values on the other. The cravat is not only a universal fashion detail, but at the same time, due to its symbolic power and aesthetic value, also a constant source of artistic inspiration. On that basis the strong promotion of Croatia as the Homeland of the Cravat is being developed through projects by the institution Academia Cravatica, which through the media is becoming well-known to the world public. 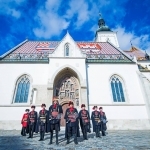 The not-for-profit institution Academia Cravatica was founded eleven years ago (1997) with the mission of promoting the cravat as a special medium and part of the Croatian, European and world heritage. Amongst the many projects already run by AC, in terms of the exceptional response of the world public, the installation “A Cravat around the Arena”, created by Marijan Bušić, and the international exhibition “The Challenge of the Cravat” are outstanding. 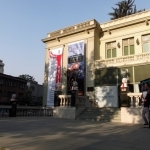 This exhibition, with a collection of about one hundred works by artists from fifteen countries (members of the jury: the academic Tonko Maroević, Ive Šimat Banov and Enes Quien), has been seen since 2004 in about ten countries around the world. 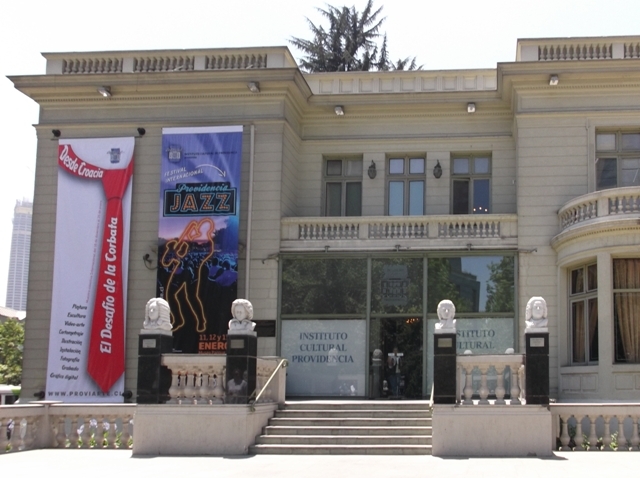 In each country the exhibition visits, it includes works by local artists on the subject of the cravat, and so the exhibition’s collection is constantly growing. The installation “A Cravat around the Arena”, created by Marijan Bušić and staged on 18th October 2003 in Pula, was as a world scale spectacle, seen on world television by more than a billion people. It was assessed as “the most ambitious, most well-thought out concept and project to promote the Croatian identity” (Ive Šimat Banov). 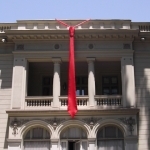 Through this installation, with the largest cravat in the world, the ancient and the contemporary eras were linked symbolically, and the red color of the cravat sent a message to the world of love and life together for all peoples and nations. 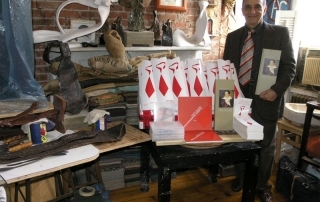 “The cravat is communication”, says Marijan Bušić, interpreting the cravat not only as a symbol of Croatia, but also a symbol of Europe and a sign of the values of civilization of freedom and responsibility.With the Croata cravats and the AC projects, Croatia is not only presenting itself to the world but is communicating with it, thereby showing its desire for openness and an exchange of cultural values with other nations. This desire for openness to other cultures, despite its suffering in history, has always been a dominant characteristic of Croatia’s relationship with the world. The cravat is a universal symbol of dignity and dress culture, and its symbolic potential also holds other values. The vertical cravat symbolizes the human vertical – human dignity and self-awareness, a moment of ceremony and celebration, success and the business spirit… By its fluttering lightness, however, on the one hand, and the knot on the other, the cravat “binds together” freedom and responsibility. It encourages us to communicate more aware of our own dignity and the dignity of others, our freedom, but also our responsibility. 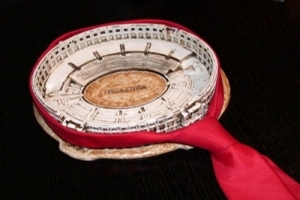 Due to its huge symbolic power, the cravat has epochal importance for Croatia and the world After the worldwide success of the Cravat around the Arena installation, which pointed out the cravat as a special medium on a world scale, in 2008 AC launched the initiative to mark 18th October every year as Cravat Day in Croatia and the world. Since it originated from the Croats, the Croatian Parliament showed the cravat special honor, and in 2008 proclaimed 18th October Cravat Day in the Republic of Croatia The cravat as a sign of dignity and self-awareness has been worn for centuries by people around the planet. Cravat Day has been marked every year in Croatia since 2008, and is being increasingly accepted in other countries all around the world. Let us mark Cravat Day this year too, in 2010! Let us wear cravats with pride and joining with others, remind ourselves of the values it communicates: human dignity, the culture of civilization, the harmony of freedom and responsibility, important moments of celebration and solemnity, business success, a spirit of community between people and nations… With the cravat we send a message of true, lasting values, as a good foundation for the future. A red cravat has been made specially to mark Cravat Day, from cloth used to make the “Cravat Around the Arena” – the art installation by Marijan Bušić from 18th October 2003. 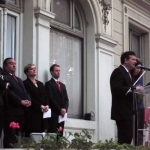 Judging by recent agreements between Franjo Bušić, director of Academia Cravatica and Diasake Kadokawa, Mayor of Kyoto Croatian cravat could soon be exposed and promoted in the cultural center of the city, still known as the spiritual capital of Japan. In that way, cravat would be displayed as a permanent exhibit in the center that is annually visited by 50 million tourists. 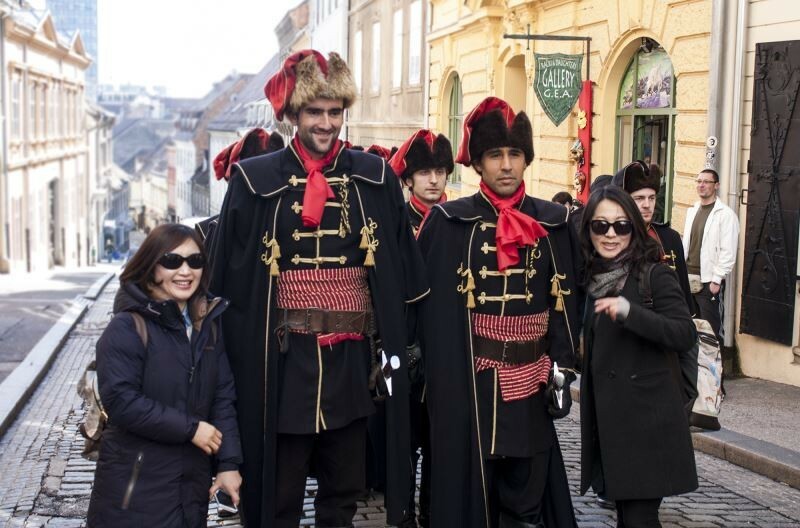 – Zagreb is the world’s capital of the cravat, and values that symbolically represents belong to the ethical values of Japanese culture – said Mayor Daisaku Kadokawa. Although the Japanese appreciate their culture, they admit – Japan has become modern with the arrival of cravat. (lk/vlm) City, 29.09.2011. 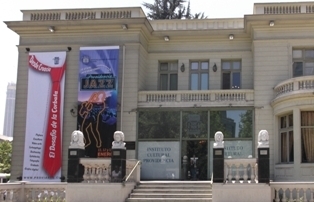 South American view of the cravat – new artistic works for the Challenge of the Cravat exhibition project collection have arrived from Chile to Zagreb During the last visit of the Challenge of the Cravat exhibition to Santiago de Chile in December 2011, at the Providencia Cultural Institute, local artists added their works to the international collection of the Challenge of the Cravat – Cravat as the Croatian Contribution to Global Culture. The works of seven Chilean and one Argentinean artist have finally made it to their final destination: Zagreb – the capital of the cravat. 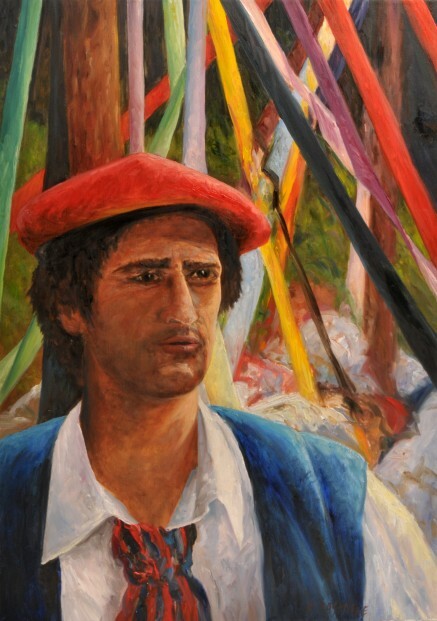 Eduardo Castillo shows a Croatian immigrant in Chile, who is connected to his homeland with a thick net of colourful ribbons behind his back, one of which found its way to his neck. Joaquin Mirauda has cast a bronze torso, centred on a very notable vertical line in the shape of a cravat. He characterizes his work as the strength which supports man. 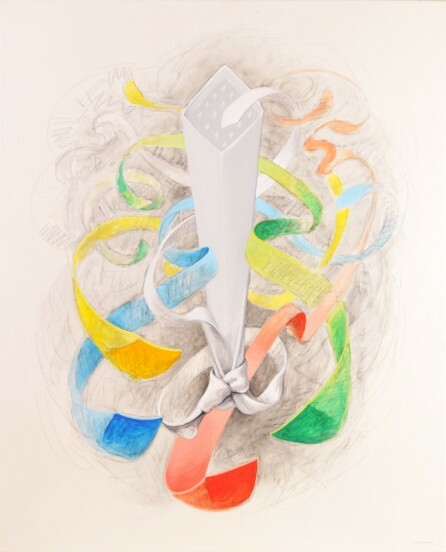 In his work Opus 833, Enrique Campuzano refers to the coming of age period, with the white cravat indicating immaculateness and innocence, surrounded by the enticing flight of fluttering yet formal ribbons. 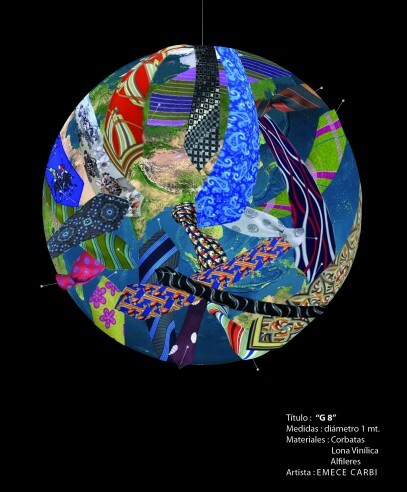 In his work G-8, Emece Carbi presents a criticism of the globalized world and the leading policies. Globally it is symbolized by the G-8, based on economic power and sustained exploitation of the disempowered. Here again the cravat has served as an attribute identifying those wearing it. Estudio de Cuerpo y Alma, in translationThe study of the body and soul consisting of the Daniella Miller y Pia Cosmelli twosome, provided two artistic photographs, two nudes donning nothing but cravats. With these works they celebrate the beauty of the body as an expression of the soul. 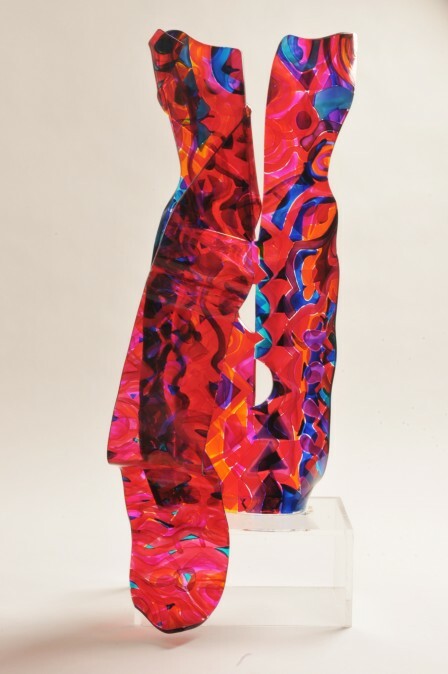 Lisi Fox as a sculptress exploited the cravat, forming it freely to emphasize femininity with underlying curves. Livia Keller gave two works. Cravat is a delicate glass work, an expression of tenderness towards a valuable article. 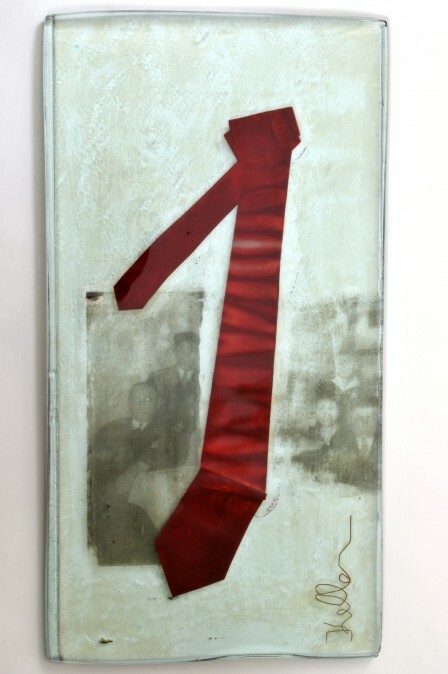 In the other work, entitled Heritage, the cravat, in connection with family photographs, is like a memento of the loved ones. 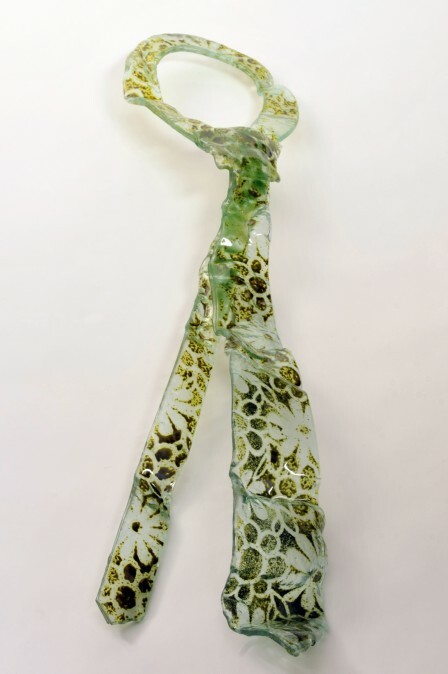 Cravat, 2011, thermo-laminated glass, cast, 92×23 cm // Heritage, 2011, thermo-laminated glass, cast with copper, 33 x 60 cm. The cravat as a motif is a confirmed inexhaustible source of inspiration for works of varied contents. Its form and role as an attribute, together with its diverse symbolism are characteristics enabling artists to create increasingly more expressive and interesting works. 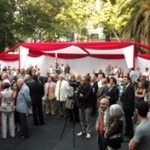 The collection of the Challenge of the Cravat exhibition project has now grown to over 150 works by approximately 15 authors originating from about ten countries worldwide, where this unique exhibition has been put on so far.